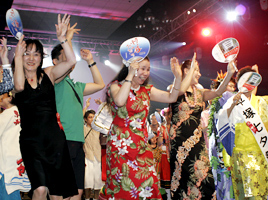 The annual Friendship Gala was held at the Hawaii Convention Center in the evening on the 2nd day of the festival. There were members of the participating groups, local businesses as well as the general guests. This is an exciting event where you can enjoy various dishes offered by the famous restaurants in Hawaii. The venue was filled with guests as the doors were opened. Also, there were long queues at the booths where there were 16 restaurants offering their dishes. Those chefs were very busy in which they served their customers up front and diligently prepared for more dishes in the back. The chef quickly prepares the dish. This is a dessert that celebrates the Year of the Rat, 2008. Also, there was an opening ceremony held on stage which was led by Kei Segawa and Alice Inoue by the time when everybody’s stomach was full. Afterwards, an awarding ceremony was held for the Best Contribution Award given by Mr. Sugi, who is the President of the Honolulu Festival Foundation. Each representative of the chosen group received the award with gratitude, which the members were cheering and taking pictures in front of the stage. During the last performance by Tonosama Ren, the audiences went up on stage and danced Awa-Odori with the performers. The people from various countries and different parts of Japan were united as one at the Honolulu Festival. The scene where everybody gets together and enjoys dancing symbolizes peace and friendship. Every year, the Friendship Gala offers a place to make friends. Kei Segawa and Alice Inoue led the opening ceremony in a smooth manner. The Best Contribution Awards. The Honolulu Festival can be successful because of all your support. The members of the chosen group rejoiced together. The cover song “Nada Soso” performed by Manoa DNA made us feel emotional. The powerful performance was given by Sugaizanairen which is their 14th consecutive time to participate this year. President of the Honolulu Festival Foundation Sugi and his wife were dancing Awa-Odori on stage with the audiences. Awa-Odori was performed even off the stage.